Warts, also known as "cutaneous papillomas", can be found quite often in puppies, as their immune systems are not mature. Aging dogs also get warts because many older dogs have weakened immune systems. There is usually more than one wart in an affected dog. It's hard to imagine, but sometimes you may find as many as 50-100 warts on a dog! What Do Dog Warts Look Like? Initially, warts on dogs are usually small in size and the color is generally pale and pinkish. Over 4-6 weeks, they grow in size, become rough and grayish-white, and have the appearance of a cauliflower. Sometimes we can also find warts that are deeply-pigmented. 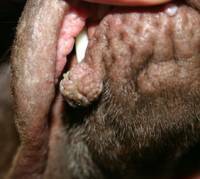 The warts usually are found on the dog's face, along the lips, inside of the mouth, and occasionally even on the eyelids, the surface of the eye, or between the toes. If a large number of warts are developed in the mouth, the dog may show signs of appetite loss, excessive drooling, and may have difficulty eating. Most warts on dogs are caused the virus called Papillomavirus (PV). The infection is transmitted through direct contact with the virus on an infected dog or in the dog's environment. It may take months after exposure to the virus for a dog to develop warts. Warts caused by the virus are, most of the time, benign (non cancerous) and will generally go away by themselves in several weeks or months (around 6 to 12 weeks). In very rare occasions, however, the warts may turn into a malignant growth (e.g. squamous cell carcinoma). Warts may also be the result of a dog's reaction to vaccinations. Many holistic veterinarians believe that a lot of dog health problems are the result of over-vaccination. They have observed and documented various long-term effects of over-vaccination, most of which include the skin, such as skin eruptions like warts and similar growths, and allergic skin irritations (such as itching). Since the warts will generally disappear by themselves over a period of time (about 6 to 12 weeks), treatment is not necessary most of the time. However, if the warts are causing eating difficulty, they can be removed either surgically or by cryosurgery (freezing the tissue). Dogs with warts should be kept separate from other dogs, especially those that are prone to develop warts, such as puppies. Also, dogs with warts in their mouths should not share drinking bowls with other dogs. there is a sudden change in the color or appearance of the wart. A sudden change either in size, coloration or appearance may mean that the wart has turned cancerous, although a change in the wart may also be due to other causes, such as an infection. Castor oil can be applied directly to the warts. It softens the lesions and reduces irritation (such as itchiness) caused by the lesions. You can also puncture a capsule of vitamin E and apply it directly to the dog warts. Regular application (for at least 2 to 3 weeks) can reduce the wart size significantly. The homeopathic remedy Thuja is a very effective remedy for vaccinosis. This remedy is especially effective for skin problems such as warts, cysts, and other skin lumps. How About Apple Cider Vinegar? 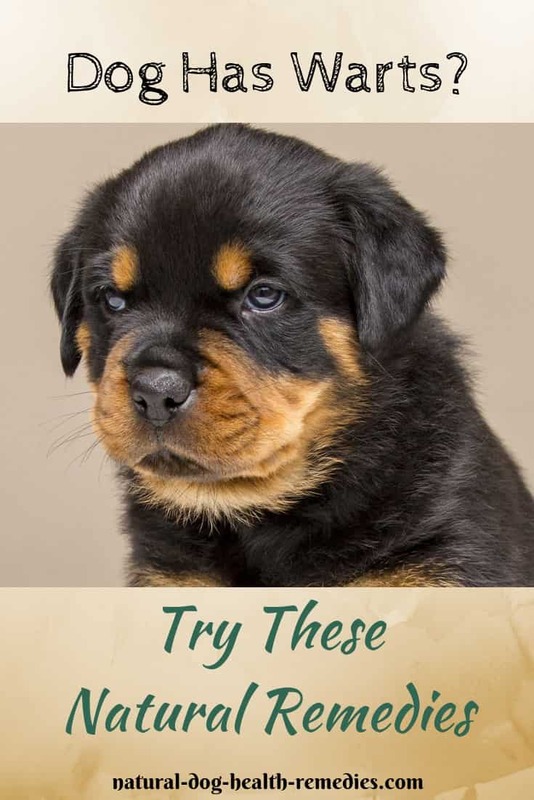 I have read some anecdotal reports from dog parents saying that applying apple cider vinegar to the warts and covering them with duct tape could get rid of the warts quickly. However, I have also read on the Whole Dog Journal that ACV is not quite effective when it comes to getting rid of warts. So... the jury is still out about the effectiveness of ACV on dog warts. If you have tried using this remedy, please share your experience below. Boost Your Dog's Immune System: As mentioned above, warts usually grow on dogs with weak immune systems. It makes sense that if you don't want warts on your dog, you should keep his immune system in top-notch condition. 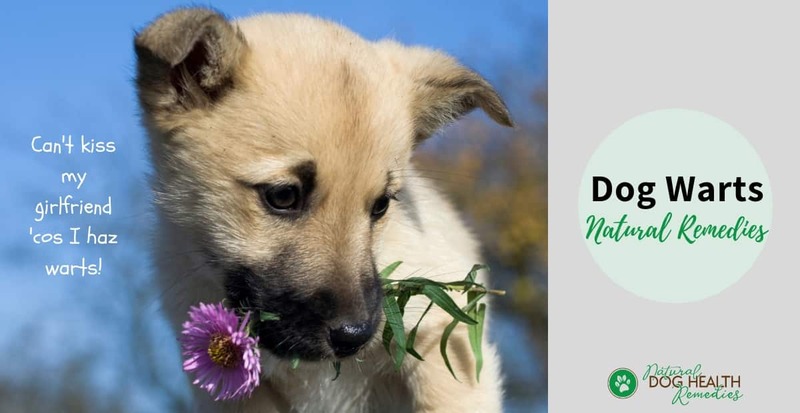 Feeding your dog a natural, high-quality diet (preferably home made) is a start. If necessary, use supplements (e.g. probiotics, digestive enzymes, Omega-3 fatty acids) to further support the dog's skin health and immune system. Avoid Over-Vaccination: Over-vaccinating your dog could compromise his immune system. Discuss with a holistic vet to see how you can minimize vaccination.